What a fantastic week F2 have had! Our theme was ‘real life superheroes’; we have learnt all about the people who help us. Ms Ahmed organised a visit from the fire service. We were so excited! 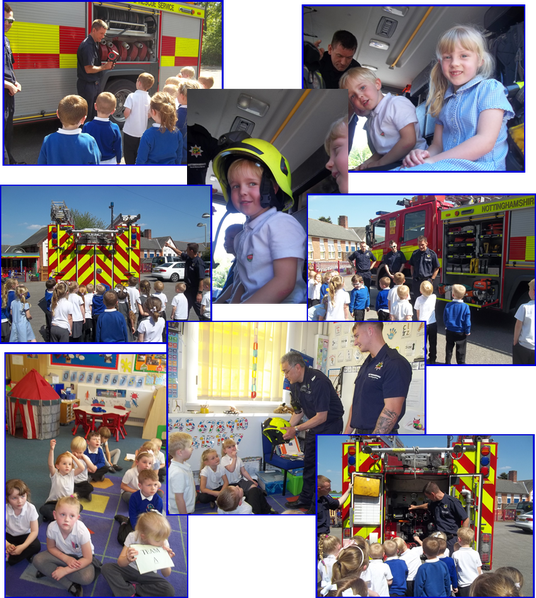 We had a talk from firefighters, who told us all about what they do in their job. We were quizzed with lots of questions. We were all so good at answering them that they left us lots of goodies to take home! Well done to all the team captains, Ethan, Olivia, Destiny and Sofia. Then it was Mrs Bailey’s turn! The firefighters dressed her in all their equipment—she looked just like a real firefighter! Then came the best bit—the fire engine! We looked around it, looking inside all of the compartments. Memphis and Kaiden were very enthusiastic! Perhaps we have some firefighters in the making? We then were allowed to climb in and sit on the back seat. Some of us tried the mask on that the firefighter use to breathe in a fire. Finally, at the end of the school day, (with a bit of encouragement from Mrs P and Mrs Bailey), the firefighters turned on the siren for us! It was really LOUD, but we loved it!!! We have also been writing about what we would like to be when we grow up; we have lots of firefighters, police officers, vets and teachers—think big and believe in yourself! We have also completed lots of reading assessments, this week. A huge well done to children who have worked hard at home, learning their keywords.